Casey Latz is an exceptional student who has been taking music lessons and participating in bands at the Youth Arts Academy for many years. At a very young age, Casey was diagnosed with Cerebral Palsy, non-progressive movement disorder. Casey does not let her physical disabilities stop her from achieving. If a new technique needs to be developed to accommodate her, she is more than willing to try it. Her motivation to excel can be seen in the variety of activities that she participates in, especially in music. 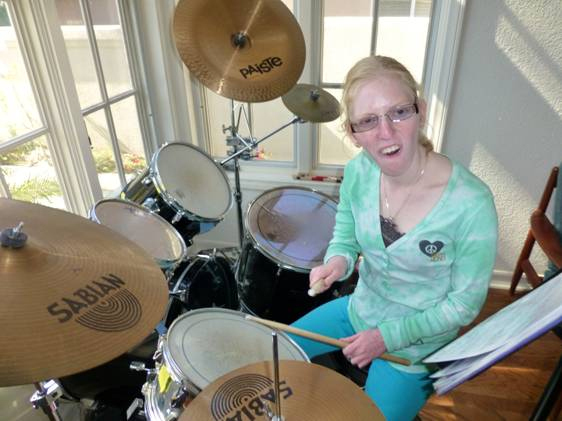 As a drum student, Casey has honed her skills in a variety of musical styles. After having developed her basic drumming skills, she has been able to progress to and excel in one of the most difficult styles; jazz. In addition to her drumming, Casey was also able to play piano with the jazz band this year. Being a member of the YAA jazz band is a joy and passion of hers. Casey has a great appreciation of the musicians around her. She is always respectful of and truly happy to see her teachers and her band mates. Casey’s ebullience is truly infectious. She is a pleasure to work with and is greatly appreciated by everyone that she works with at the Youth Arts Academy.